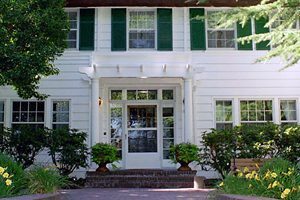 The Friends of McLean Park and House is a 38 year old non profit organization whose purpose is to aid and assist the city of West Linn in the historic preservation of the house and grounds for the benefit of the community. Activities the Friends carry out include caring for the house and grounds, sharing the history of the home and the memory of Doctor McLean’s significant contributions to the community, and facilitating use of the property for a variety of events, public and private, so the community can enjoy this amazing place. The Friends raise funds for the house and grounds through private events, grants, an annual dinner & auction, donations, and membership dues. Replaced the kitchen floor with a snazzy black and white check reminiscent of a bygone era. Replaced the hot water tank. Replaced the commercial grade dishwasher. Master Gardener volunteers took on the front garden zone, replacing bushes and planting trees. Another volunteer couple worked tirelessly to bring the rose garden back to its glory days.